Kati O’Toole and her husband, Darin Robison, have transformed their lofty dream into a reality with their new business venture at Montana Treehouse Retreat, a unique backyard escape that spirits guests into the treetops. Campers looking for an outdoor experience that transcends pitching a tent or renting a cabin in the wilderness will get a thrill out of the latest trend of lodging — a vacation rental in the sky. Located on the couple’s wooded 7-acre property off Dillon Road near Whitefish, the retreat incorporates the growing popularity of custom luxury treehouse dwellings with the mountain allure of Montana. Professional treehouse designers have capitalized on the trend by building everything from breweries to recording studios, but a rising number of backyard escapes are cropping up across the nation, advertised as guest rentals on the online hospitality service Airbnb. 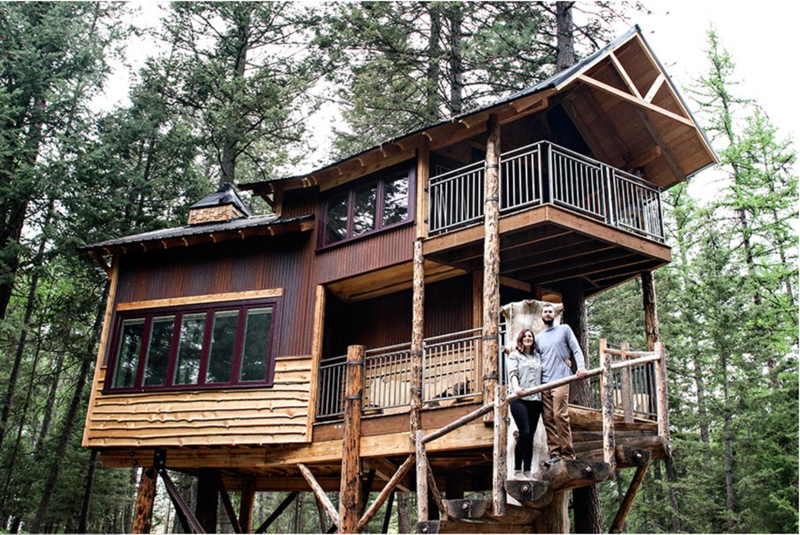 The couple’s treehouse made its television debut on May 15 on the DIY Network’s show “The Treehouse Guys,” whose crew visited the Flathead Valley to help frame the structure, which spans four trees — three larches and a ponderosa. In addition to showing the early construction of the treehouse, the segment also features local activities and amenities of the Flathead Valley, and will re-air next month. From the moment that O’Toole and Robison purchased their property five years ago, they’ve entertained visions of building a treehouse in their expansively forested lot, but with a growing family, full-time jobs and a basket of home projects, they were short on time. Both fourth-generation Montanans with a passion for the outdoors, their passion project was sidelined as they worked to keep up with their 3-year-old son, Rowan, and newborn baby, Ry. When a friend pointed them to a casting call for the television show, they navigated a series of lengthy interviews and were selected for an episode. O’Toole and Robison applied for and received a conditional use permit for their property, with the county Board of Adjustment granting approval for up to three high-end treehouses available for nightly rental. The build crew with the Treehouse Guys — B’fer Roth and his team of “tree muskateers” — completed the frame of the treehouse in about six weeks and provided their expertise, while Darin and a crew of friends and family helped build a giant log spiral staircase, milled the siding and interior paneling, and anchored the structure to the trees. Because it’s not connected to the earth, the house moves with the trees during high winds and as the trees grow. The 18-foot wooden spiral staircase leading up to the entrance of the treehouse wraps around an old Douglas fir that had been struck by lighting on Robison’s grandparents’ property. The top blew off in the wind, leaving a 60-foot stub that Robison thought was perfect for his treehouse. “It was definitely the right one for the job,” he said. The maximum size of a treehouse is determined by the number of trees available to serve as its foundation. A single large, healthy tree can support a 350- to 400-square-foot treehouse, according to the builders, while two or more trees can hold a 700- to 800-square-foot structure. O’Toole and Robison plan to begin renting their treehouse in November once they’ve completed the finishing touches, and construct two additional custom treehouses on their property in the coming years. The two-story treehouse features all of the amenities including septic and sewer, a small kitchen on the lower level, as well as a living area and full bath. It rents for $500 a night, with a minimum of three nights and discounts available for weekly rentals. O’Toole said she has already begun receiving inquiries, and predicts an uptick in interest following the airing of the show. For more information and to book a getaway, visit http://www.montanatreehouseretreat.com/ and to learn more about The Treehouse Guys check out http://www.diynetwork.com/shows/the-treehouse-guys.